There are few insects more destructive than the Emerald Ash Borer. 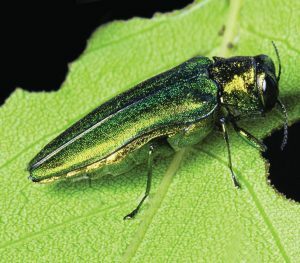 The Emerald Ash Borer is an invasive species of beetle that has killed tens of millions of ash trees, from forests to neighborhoods. All native ash trees are at risk, and if left untreated, trees may die within two to four years after they become infested. Adult female Emerald Ash Borers lay their eggs between bark crevices, flakes, or cracks. 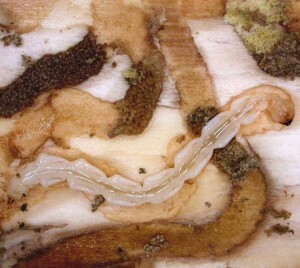 Emerald Ash Borer larva tunnel under the bark of the tree and disrupt the tree’s ability to transport food and nutrients eventually causing the tree to die of starvation. Adult beetles are most active during the summer and early fall. If you see the beetle or any signs of Emerald Ash Borer damage, you should contact us to begin Emerald Ash Borer treatment on your ash tree as soon as possible. During the late summer, fall and winter months, the beetle’s larvae tunnel deep into the trees they infest only to tunnel out in the spring.